Hi! The time has come for another Card of the Week, and we’ll be looking at a multifaceted Physical Combat card from Heroes & Villains. The Black Style is usually viewed as a more controlling archetype, but it is still capable of dishing out massive amounts of damage. The +1/+1 modifier from Black Devious Mastery enables you to pressure the opponent from both attack angles, and Black has some hard hitting haymakers with cards like Black Overpowering Attack, Black Fist Lock, and Black Lunge. Black Enraged Assault deals a respectable 4 stages and 4 Life Cards of damage, so it keeps pace in a Black beatdown deck. At the same time, its HIT effect provides an element of control by denying resources. While Black Searching Technique or Black Interceptor Barrage may provide similar amounts of damage/manipulation, Black Enraged Assault gives you the option to save deck slots and move towards a more offensive midrange build. Consider pairing it with cards like Black Side Thrust and Black Disorienting Blow for a good mix of damage and utility. Tactically, utilize your Mastery or other banish effects to ensure that Black Enraged Assault can snipe a key card early on in the game. 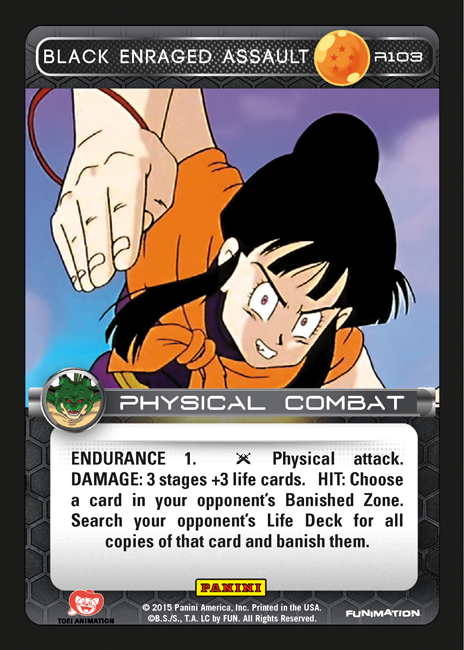 Finally, give thought to MPs that enhance your aggro-control strategy such as Nappa, Captain Ginyu, or Nail. Black is seen commonly in the current metagame, but usually as a slower and more calculating deck. Catch your opponents by surprise with a more aggressive build, and give Black Enraged Assault a try!